With Western Maryland back in bloom, tick season is here, and regular tick checks are more important than ever for people and pets in the region. Frostburg State University researchers have been studying the tick population in Rocky Gap State Park in recent years. Worryingly, 25 percent of the ticks they collected in 2016 tested positive for Lyme disease. Now FSU’s Dr. Rebekah Taylor, assistant professor of biology, and her students are expanding their study of Lyme disease-bearing ticks across the region. To succeed, they need the public’s help. Taylor is asking people to mail her any ticks they find within the greater Western Maryland area: in a roughly 100-mile radius that covers the area north to Pittsburgh, west to Morgantown, W.Va., east near Frederick and neighboring West Virginia counties. Ticks must be dead, enclosed in a sealed plastic bag, securely taped to a piece of paper and labeled with the date and approximate location where they were found. Tick samples may be whole, partial or crushed. If a tick is still alive, it should be frozen for 24-plus hours before mailing. Mail tick samples to Dr. Rebekah Taylor, Frostburg State University, 101 Braddock Road, Frostburg, MD 21532. A years-long project for Taylor, the research will provide practical learning experiences for many classes of students, each building on the work of those before them. Taylor aims to establish FSU as a public resource for tick-borne disease in Appalachia. She cannot provide test results from individual ticks, but the data she collects will help create a public map highlighting Lyme-bearing tick locations across the region. Identifying hotspots for Lyme will help people – and their pets – avoid the disease. Taylor’s grad student, Sarah Kuchinsky, who received her master’s degree last May, found that few of the residents she met understood how people get Lyme disease or its effects. Lyme disease is spread by deer ticks (also known as blacklegged ticks), which are found on or near deer and small rodents like mice, squirrels or chipmunks. Ranging in size from smaller than a poppy seed to about the size of a sesame seed, a single deer tick can transmit Lyme disease after attaching for 24-plus hours. Painful symptoms can linger even months after treatment. With the help of Hannah Elliott, who earned her bachelor’s degree last May, Kuchinsky and Taylor set and checked 200 live rodent traps per day at 21 human-dominated sites in Rocky Gap State Park in the summer of 2016. Rodent blood and ticks were processed in the lab, where Kuchinsky found Lyme-causing bacteria in nearly 20 percent of the rodent samples and about 25 percent of ticks. The research project also confirmed a suspected incubator of Lyme-positive ticks: Japanese barberry. Sold as an ornamental planting, Japanese barberry offers a safe haven to Lyme-positive rodents. Kuchinsky’s research won her the Best Poster Presentation award at Frostburg’s 2017 Graduate Research Symposium, and she shared her findings with industry professionals at the 2017 American Association of Immunologists annual meeting in Washington, D.C.
Lyme is America’s most common vector-borne disease (those spread by infected arthropods like mosquitoes or ticks). About 30,000 cases are reported each year, with many more cases suspected but unreported. While frequently found elsewhere in Maryland at lower elevations, Lyme was uncommon in Western Maryland until recently, Taylor said. With 25 percent of ticks testing positive for Lyme-causing bacteria, Taylor said Western Marylanders need to check frequently for ticks and watch for Lyme disease symptoms. The Centers for Disease Control lists early signs of infection such as fever, a rash, severe fatigue, facial paralysis or joint pain within 30 days of a tick bite. To learn more about Lyme disease, identifying ticks and preventing tick-borne disease, Taylor recommends www.tickencounter.org or www.cdc.gov/lyme. 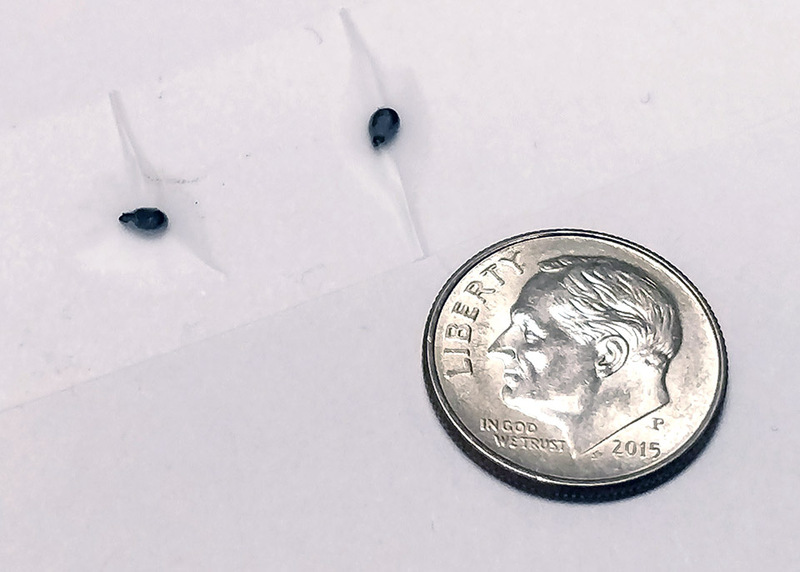 To show the scale of a deer tick, toasted sesame seeds – which are the approximate size of adult deer ticks – are shown next to a dime.